Percusize Me! : "Method of Movement for Marimba" already available in Spanish. 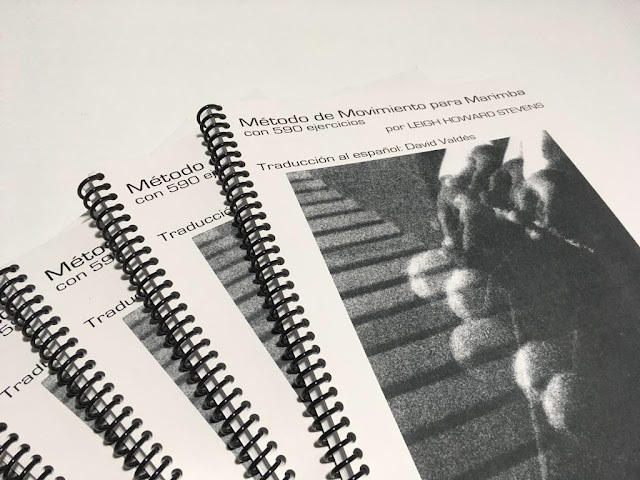 "Method of Movement for Marimba" already available in Spanish. 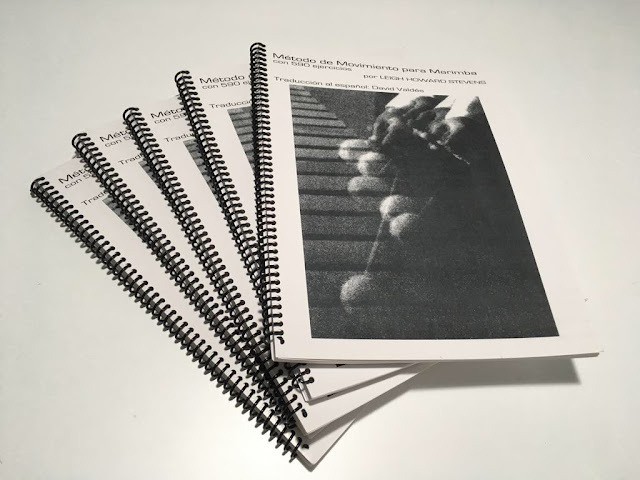 Last April 9th was a very special day: after very hard work, effort and excitement, "Método de Movimiento para Marimba" (L. H. Stevens) was, at last, published. This is a long awaited project into which both Leigh and I have put our best. My job? Translating into Spanish the most important marimba book ever written. Everyboy knows the importance of the contributions to the marimba world made by Leigh Howard Stevens and how his method for holding and manipulating four mallets revolutionized the percussion world: "MOM" is a reference for marimbists around the world since it was first published in 1979. The way he holds and moves the mallets, how he wraps them, the use of rigid birch handles, one handed independent rolls, the different stroke types, the use of tuneable resonators along the entire range of the instrument, super wide keys, the design of height adjustable frames, the works he has written or others have composed for him, his books, records..., have made of Leigh Howard Stevens an omnipresent figure and a reference for all marimba students, players and teachers. I was lucky enough to be a student of his at the Royal Academy of Music, where I got my "Postgraduate Diploma in Timpani and Percussion". After leaving London, I got in touch with him and suggested the project. Taking into account that his ideas have left a special mark in Spain, that the Spanish speaking market is made of 500 million people, that there are countries in America with an important marimba tradition (Mexico,Guatemala...) and that Spanish was one of the major languages into which "MOM" was still not available (it´s been published in French, German, Italian and Japanese), Leigh decided to go for it (I have to proudly say that his literal words were "I can´t think of anyone else better than you for this project"). "Method of Movement for Marimba" has been reprinted and re-edited several times during its existence. It was 25 years old in 2004, and that was celebrated with a revised and expanded commemorative edition. It was this 25th anniversary edition the one we used as the basis for the Spanish version. Translating Leigh is quite a hard task, as his sense of humour, double meanings and jokes have no correspondence in Spanish, but truly yours enjoys the same kind of humour, making the Spanish version a very true to the essence text. 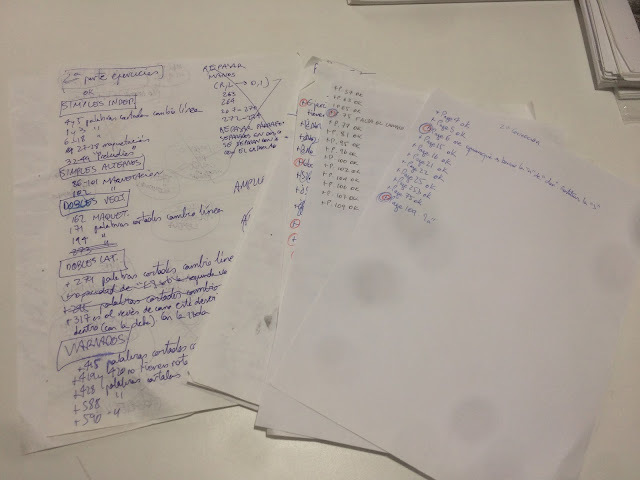 Another trouble I faced (a big one) was that, contrary to English, which can express thoughts using very few words, Spanish needs complements, subordinates, conjugations... Spanish is way more complicated in terms of grammar than English is. This expands the text considerably, resulting in a total mess when it comes to layout. We had to keep the design as close as possible to the original, and that, considering we had a much larger text, was a total challenge.. The next step was a proof print. 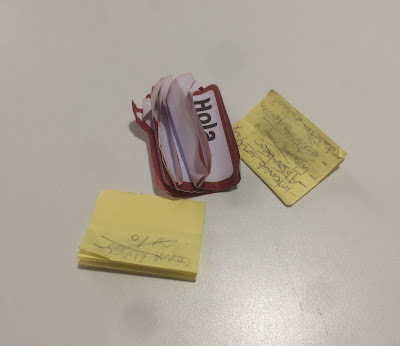 I have to say this edition has a new feature the previous ones don´t: spiral binding. 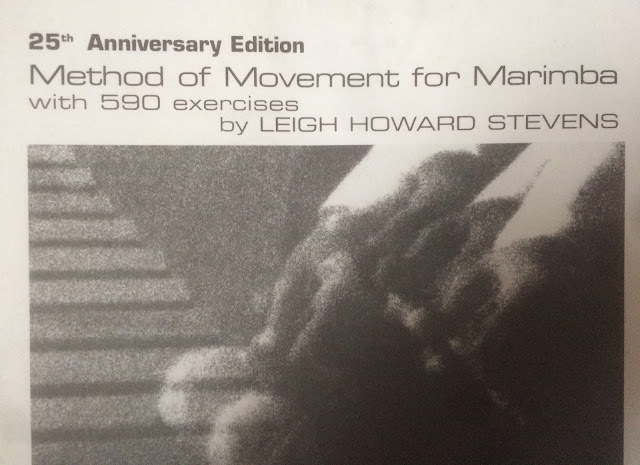 A book containing 590 exercises is going to be used on a music stand most of the time, so it must be convenient for that purpose. The standard classical binding was substituted with a spiral one. I´m sure you will like this improvement. 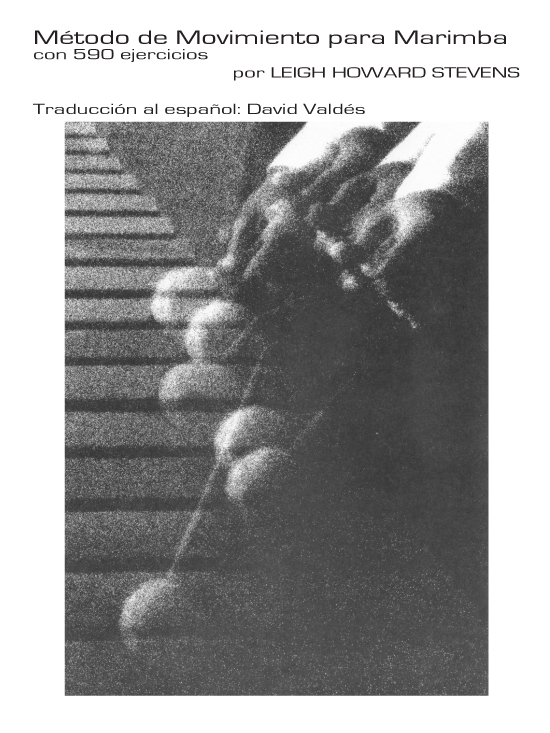 Finaly, the press did its job and "Método de Movimiento para Marimba" is now available. Working on this project has been amazing... I have put my body and soul into it. I can proudly say everything in it, ABSOLUTELY EVERYTHING, is the result of my own efforts. From the initial idea to the translation (which I tried to make as neutral and panhispanic as possible, without local expressions, keeping the original spirit, humour and style of the author, true to the original and, at the same time, tryining not to make it sound "like a translation", but like something a Spanish speaking person would have written), from the layout to the redesign of some photographs (those original archives containing text had to be modified), from asking the Spanish Academy to the work with InDesign (from scratch... I had to get a Mac for this job, learn how to use the software, pay a subscription, learn how to layout...). It was a hard job. Extremely hard... 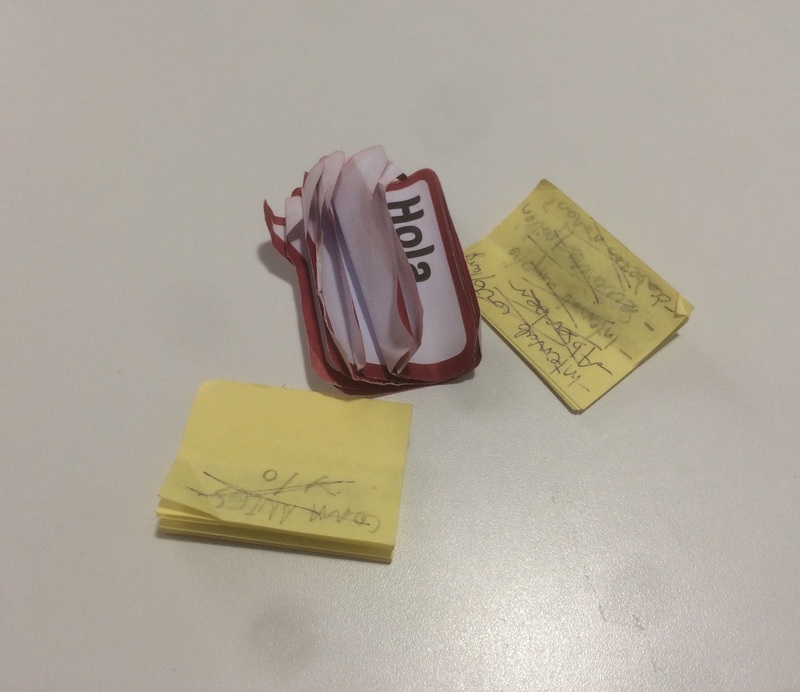 But, I have to say it´s been a very rewarding one. 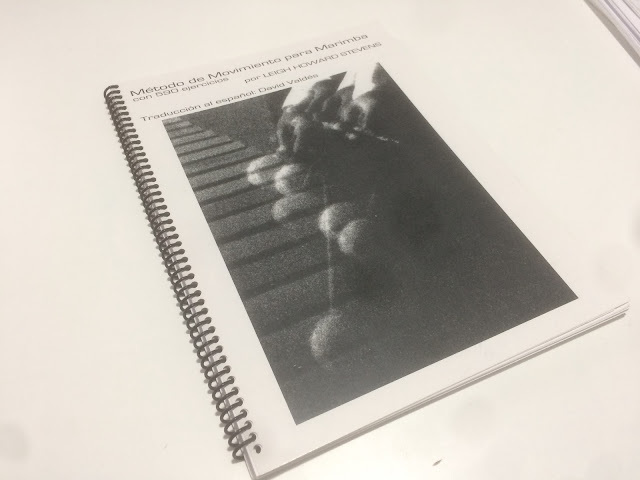 I would have never imagined, when I started playing marimba at the age of 16 that, not only I would end up studying with the author of the book I was using in my lessons, but that I would be the translator of the most important book ever writen for our instrument. I got help from Sofía, my wife, who already knows the book by heart because of the many times she has read it in search of mistakes. From Diego, from whom I borrowed a Mac, as all the fonts, links and archives were useless in a PC. 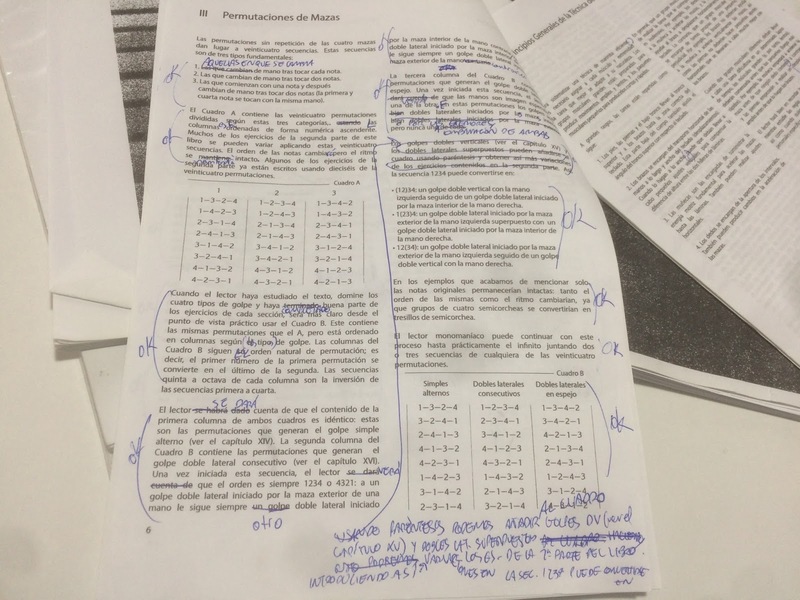 From Maite, who tought me how to use InDesign from scratch and was extremely helpful. From Jorge, a physicist and a former student of mine, who checked that all the scientific terms and expressions were ok. From David, the person in charge at Marimba Productions Inc. and my guardian angel that side of the pond, who corrected all the details (sometimes microscopic) both in the book and on the website. From Leigh, who trusted me for this project. "Método de Movimiento para Marimba" can now be purchased at mostlymarimba and music stores. Is this good news? 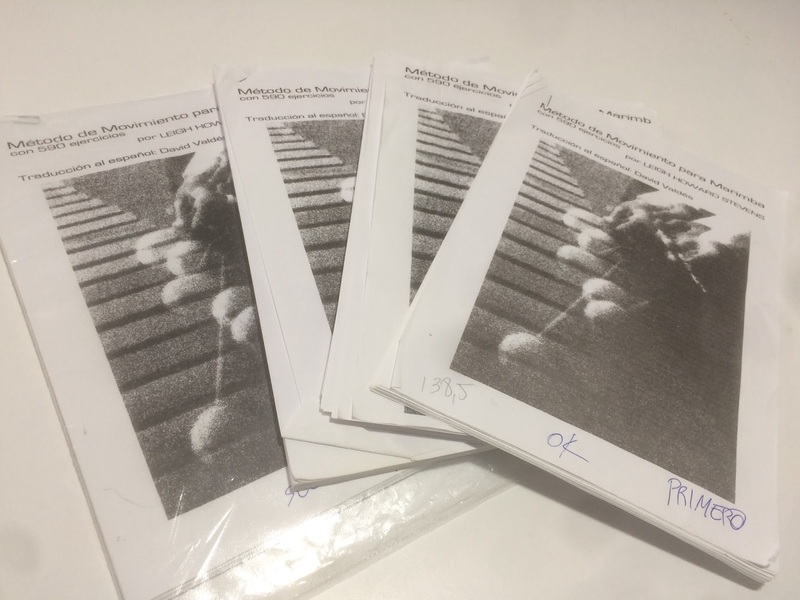 Do you know any marimbist who could benefit form this edition? Ask me any question you may have and I´ll be happy to answer them.